At a recent meeting in Powell, I was asked how to best use ethofumesate (active ingredient in Nortron SC and other herbicides) in fields that must be furrow irrigated for sugarbeet emergence. This is a difficult question. Ethofumesate (and almost all soil applied herbicides) require soil moisture to be effective. Ideally, residual herbicides should be applied to the soil shortly before either rainfall or overhead irrigation. Growers who have sprinkler systems in their field can apply 0.5-inches of irrigation water after ethofumesate application, and this will be enough to activate the herbicide. Furrow irrigated fields in the Big Horn Basin of Wyoming present a problem for soil-applied herbicide incorporation. The primary issue is that we simply do not receive enough precipitation in the spring to allow crops to germinate and emerge without irrigation. This is different from many other growing regions, even those where irrigation is required. For example, in the southeast part of the state (Goshen County), irrigation is required for sugarbeet production, but spring rains are regular enough that it is uncommon to irrigate for emergence. Rainfall is not something we can depend on in the Big Horn Basin of Wyoming; average precipitation (rain and snow combined) is less than 6 inches annually in Powell. Because of the limited precipitation, sugarbeet growers in the Big Horn Basin create beds (usually in the spring), then plant the crop on the top of the beds. 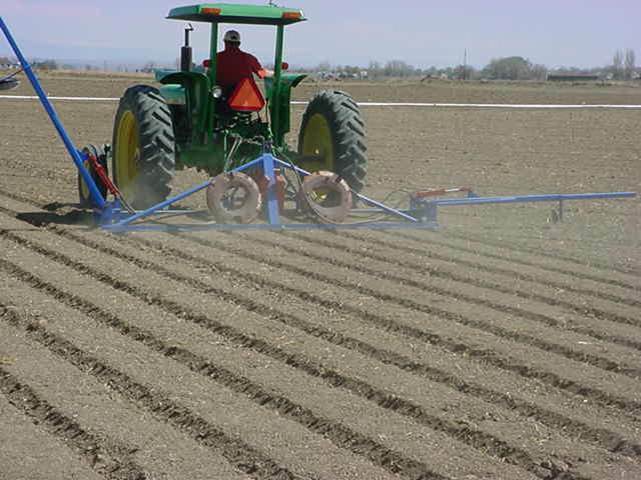 The bedding operation creates the furrows that are required to irrigate the field to stimulate germination and emergence. Although the ideal situation would be to make the beds, apply the herbicide, and pray for rain, most prayers for rain go unanswered in Powell. So the question is: when (and how) do we apply the preemergence herbicide in relation to bedding and planting. In 2004 through 2006, Dr. Abdel Mesbah and Dr. Steve Miller conducted research to answer this very question. They applied Nortron (either as a standard liquid spray, or impregnated on dry fertilizer) at two rates: 1.25 lbs or 2.5 lbs of ethofumesate ai per acre. These are both relatively high rates for our region; 1.25 pounds of ethofumesate ai is equivalent to 40 fluid ounces of Nortron per acre. Nortron rates of 24 to 32 fluid ounces per acre are more common. The reason they used higher rates in the study was to ensure that they would be able to observe any injury that may be caused by the application methods and bedding procedures. After applying Nortron, they incorporated the herbicide into the soil with a roller harrow, and then created the beds. They used two implements for the bedding operation; either with “large” or “small” soil movement. Bedding operation with “small” soil movement. Bedding operation with “large” soil movement. The reasoning behind this is that if we move a large amount of soil during the bedding operation, there is potential to have very high concentrations on top of the beds (where the soil is being moved to) and a low concentration in the furrows (where the soil is being moved from). This could potentially result in poor weed control in the furrows, and greater potential for sugarbeet injury on the beds. After the bedding operations, sugarbeet were planted, stands were counted, injury was evaluated, and the studies were harvested at the end of the year to evaluate yield. No sugarbeet stand loss was observed in any treatment in any year of the study. Injury symptoms were minor in 2004 and 2006, especially at the 1.25 lbs ai/A rate; however, ethofumesate injury was substantial in 2005. Liquid applications of ethofumesate caused more injury compared with dry applications on impregnated fertilizer. The amount of soil movement did not have a major impact on the amount of injury observed. Sugarbeet yield followed a similar pattern as visual injury evaluations. If ethofumesate was applied as a dry impregnated fertilizer treatment, sugarbeet yields were similar or greater than the check (no ethofumesate) in all 3 years. Liquid applications of ethofumesate caused a reduction in yield regardless of rate. The amount of soil movement had no observable impact on sugarbeet yield. This research indicates that the amount of soil movement during the bedding operation is not a major contributor to sugarbeet injury from ethofumesate. Ethofumesate rate and formulation type will influence the amount of injury observed. Ethofumesate applied on impregnated fertilizer increased the safety compared with liquid applications. If applying ethofumesate in sugarbeet before the bedding operation, impregnated fertilizer is the safest method. Reducing the ethofumesate application rate can also increase safety to the sugarbeet crop. Ethofumesate rates of 0.75 to 1.0 lbs ai/A (24 to 32 fluid ounces of Nortron), mechanically incorporated into the soil, then bedded should provide acceptable control of early season weeds while minimizing risk of injury to the sugarbeet crop. If applying ethofumesate as a liquid spray, apply 24 to 32 fluid ounces per acre, and mechanically incorporate. If applying dry fertilizer impregnated with ethofumesate, apply 32 fluid ounces per acre and mechanically incorporate. 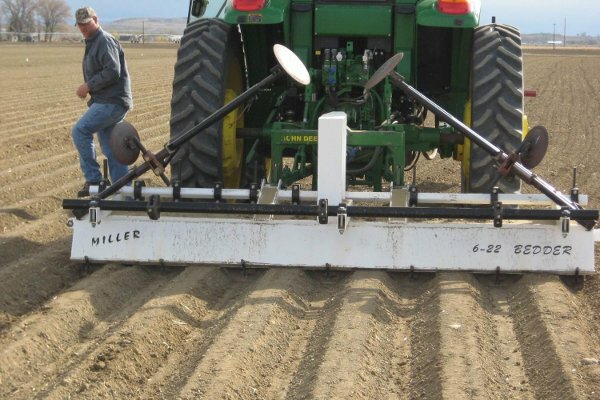 Use a roller-harrow or other implement to incorporate the ethofumesate uniformly to a 2-inch depth. During the first irrigation, be sure the soil is wetted all the way up to the sugarbeet row to ensure uniform efficacy. It is still possible, even when using these best practices, that certain environmental conditions could cause sugarbeet injury. Heavy precipitation (rain or snow) shortly after planting presents the greatest risk. However, the recommendations above will provide early-season weed control while minimizing the potential for crop injury. Next Article Where are the super weeds?